I just spent a week driving a stripper-model 2018 Hyundai Accent, and I must say: I was pleasantly surprised. It honestly might be among the most fun new cars you can buy for just about $16,000. I’ll admit that I wasn’t exactly excited about driving a Hyundai Accent. A few weeks prior, I had spent roughly 10 minutes behind the wheel of a 2018 model with an automatic transmission, and it wasn’t a riveting automotive experience, per se. But the manual transmission—oh, it changes everything. We had a similar take recently on the manual Toyota Yaris, and together these may prove that while small car sales are down, you can totally have strippo econobox manual gearbox fun these days if you know where to find it. The shifter feels fantastic. The throws are just the right length, the feeling of going into gear is perfectly notchy, and the clutch is stiff, but not too stiff. It’s a wonderfully dialed-in transmission that made driving the modest Hyundai actually fun. This is why my friend Clark and I took the little sedan on a 500-mile road trip to the Auburn Cord Duesenberg Museum in Auburn, Indiana. Clark is a robust 6' 8", so I figured this was going to be a tight squeeze. But actually, he fit in the Accent remarkably well. Sure, the seat and footwell were a bit narrow for him, but headroom and fore-aft legroom were decent (though there wasn’t much room for a rear passenger with the seat all the way back). And that’s not always the case when rides in anything smaller than a heavy-duty truck. We headed west on horribly maintained Michigan roads towards Ann Arbor, and then south in the direction of Fort Wayne. 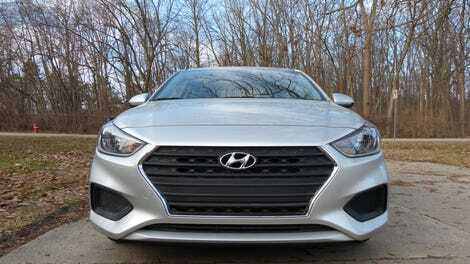 The Hyundai handled the highway just fine; it wasn’t terribly loud, the substantial sidewalls on the 15-inch steelies meant I could tackle potholes without worrying too much about a puncture, the standard cruise control made staying near the speed limit easy, and the standard Bluetooth meant I could take phone calls without crashing into a ditch. But where the Hyundai really shined was in city driving, where I had the chance to rev that engine to its 6,500 RPM redline, yank that lovely shifter down into second gear, and actually accelerate at a pace far quicker than I had expected the little Hyundai to be capable of. I didn’t run any 0-60 tests, but Car and Driver says the thing can manage the sprint in only 7.5 seconds, which is actually decent for a fuel-efficient econobox. Powering the baby Hyundai is an all-aluminum 130 horsepower, 119 lb-ft 1.6-liter GDI four-cylinder, which—at least with the six-speed manual and its 3.6:1 first gear ratio and 4.06:1 final drive ratio—gave the Accent life. The motor actually sounded somewhat exciting when revved to redline before each gear shift. But on the highway, it behaved and mostly kept its mouth shut. I did notice some significant road noise and harshness at about 1,400 RPM under no load, though. Something happens at that particular engine speed—perhaps the rotating mass reaches some sort of resonance frequency—and the car shakes, making it feel like the engine is stalling. I found myself reaching that engine operating point only in short transient conditions, so it wasn’t a huge deal, but caught me off guard. The Accent’s interior was clearly an exercise in simplicity, and in some ways, that’s refreshing, while in others, it’s annoying. First for the advantages: the touch screen just works. Yes, it’s tiny, but it’s not finicky. You click a “button,” and it obeys your command—it’s that simple. The display is also a bit tilted towards the driver, which is a nice touch. I also like the basic HVAC and radio controls. If you want to change the station, just press the physical buttons under the screen. Want to change the volume or turn off the radio entirely? Turn or push the knob on the left. There’s a dial for the temperature on the left, blower setting in the center, and HVAC airflow door position on the right, with a recirculation button and a rear window defrost button just next to the center dial. All these controls, along with the keyed-ignition switch, are fairly old school, and used to be standard in most cars prior to the proliferation of giant infotainment screens. It took a drive in this Accent for me to recognize that such a basic setup still works well. I was not, however, sold on the lack of a center console or any armrest at all. The higher “SEL” trim does get the “Sliding center armrest with storage compartment” as standard, but my lowly SE did not. While I’m totally cool with some cost-savings to keep the base price down, I’d really like a place for my passenger and me to rest our elbows. It doesn’t even have to be a sliding console; just raise the hard plastic organizer between the seats up eight inches or so. That’s all I ask. Speaking of hard plastic, there’s a crap-ton of it in the Accent’s interior. And I don’t mean it’s in places where the driver or passenger don’t normally touch (like the dashboard), I mean there’s hard plastic basically all over the place. The door trim, the dash, the door armrest—pretty much everywhere but the steering wheel, which seemed to be made of plastic too, but a squishy sort. I personally am OK with the basic plastics; I didn’t really feel any less comfortable because of them, and aside from the lack of an armrest, cruising down the Indiana highway in the reasonably cushy cloth seats (for me, that is; Clark was a bit too wide for them) was actually a relaxing experience. After about 200 miles soaking up the freeway at 75 mph, we arrived at the Auburn Cord Duesenberg museum, which is located in an original headquarters building of the now-defunct Auburn Automobile company. I cannot possibly include enough photos to communicate how impressive the museum is. It’s not only enormous, but it includes so many different facets of automotive history, from engineering displays to design studio showcases to enormous collections of historically significant vehicles—and not just Auburns, Cords and Duesenbergs. There were Packards and Internationals and even Corvettes. Anyway, eventually we had to head back to Michigan, but this time, instead of taking the highway, Clark and I took the back roads so we could see some nice countryside, and also row through some gears. After passing through the town of Auburn, and driving past the old-school court square, we pretty much just winged it, and drove in any direction that wasn’t south. Our path took us through some of the most beautiful parts of the U.S.—farm country. Vast fields flanked the county roads we drove on, horses stood around staring at the little Hyundai as it drove past, while some others pulled buggies owned by local Amish communities. Giant grain silos abounded, as did train tracks to transport their contents. Small farm towns filled with rickety old houses were quiet as the little Korean sedan jogged through on a Sunday evening. For hours, Clark and I drove the Hyundai down whatever road looked the most interesting. The pothole-ridden dirt roads didn’t bother the Hyundai, and the manual transmission—as well as the low 2,500 pound curb weight—made backroad hooning in rural Indiana a good time. After a while we crossed into Michigan, where we realized we’d somehow gone all the way west past Kalamazoo. All the back-road driving through beautiful, peaceful rural country had made us lose track of time, and now the fuel tank had reached E.
After unscrewing the filler cap and shoving the nozzle into the neck, Clark and I had a look at the on-board computer; it read over 38 MPG—a great number for any purely gasoline-powered vehicle that can carry more than just a couple of passengers. 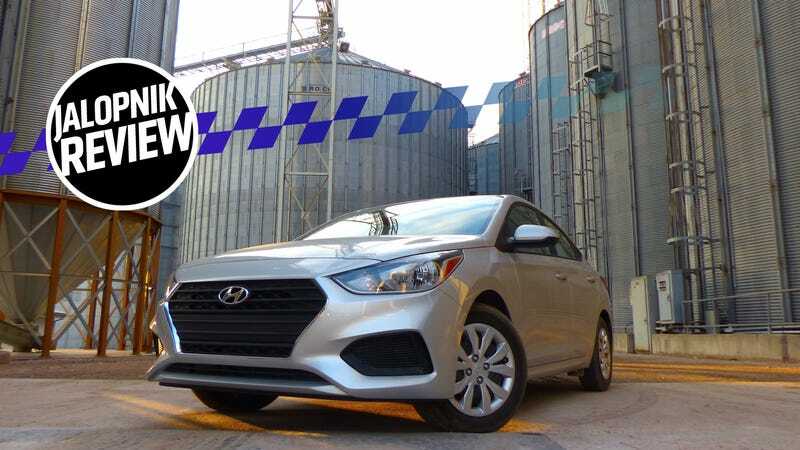 For $16,005, my manual 2018 Hyundai Accent SE seems like a solid deal. I’ll admit that I haven’t driven much of the competition lately (I drove an automatic Fiesta four years ago), so I can’t say how this stacks up. But I can say that I actually enjoyed driving this handsome (the rear end doesn’t look “chopped off” like other small sedans), cheap, lightweight, reasonably quick little econobox. The Accent has a torsion-beam rear suspension and MacPherson struts up front, and it only makes 130 horsepower, so obviously this is all relative—handling and acceleration aren’t going to rival sports cars by any means, and neither is braking, as this car has standard rear drums. But as a dirt-cheap commuter car—even without a center armrest, and with its hard plastics and NVH issues—I’ve got to say, I’m a fan of the 2018 Hyundai Accent. Mostly thanks to that manual transmission.